Australia proved too strong for England as they clinched the two-match Test series with a 54-47 win in Canberra. 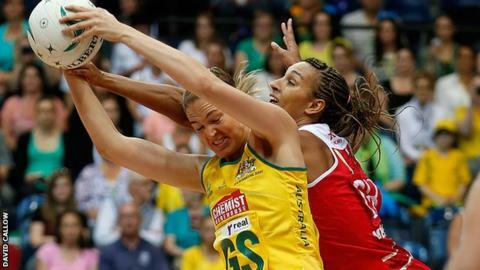 The world champions, who won the first test 55-37 in Victoria, opened up a 16-9 lead after the first quarter. England stayed in touch in the final three quarters, but could not close the margin to less than three goals. "We're just happy to get out here post Commonwealth Games to see where we're at ahead of the World Cup," said England player Serena Guthrie. Another victory for the Australia Diamonds means they finished the 2014 season with a 100% record. The hosts' attacking play was too strong for England from the start, with Caitlin Bassett scoring 32 goals from 40 attempts. England were seven points behind at half-time but rallied to win the third quarter 13-10, and close to within five points. But the Commonwealth Games gold-medal winners finished strongest to extend their winning record and take the series trophy. "We came to within three, but unfortunately it slipped away in the final quarter," added Guthrie. "But we're really proud of the girls' performance." England now turn their focus towards another Test match series in New Zealand, and the 2015 World Cup in Sydney.